I JUST WANNA NOE...DOES ANYONE WANT ME TO PUT UP THE ORIGINAL ONE? WITH OUT ANY WORDS? CUZ I THINK IT LOOKS BETTER BUT I DON'T WANT TO LIKE SUBMIT ALMOST THE SAME WALLPAPER TWICE..SO TELL ME! 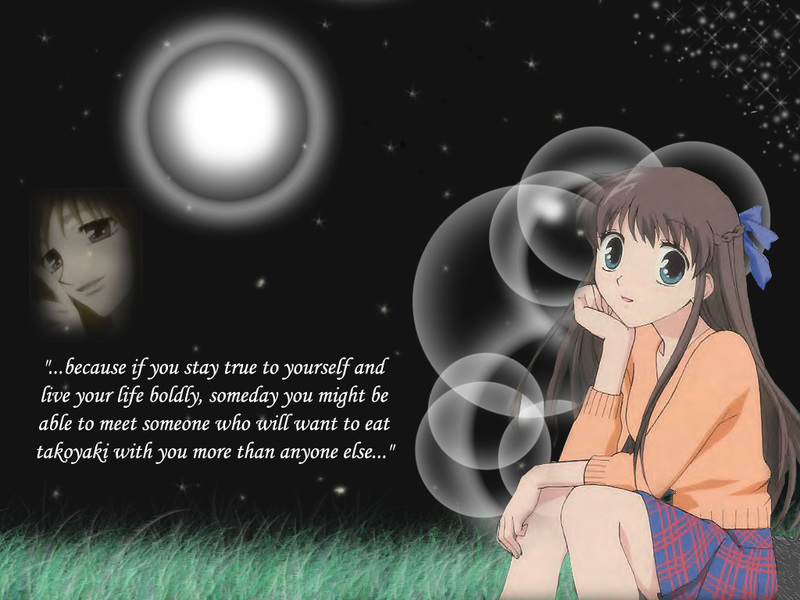 hmm..i got the picture from another picture..i changed the background to stars and i cleaned up tohru's picture a little bit..i made it adjust to the background..this looks like a common picture so people might see this around a lot...so i guess the tohru pic isn't mine but the background is. this is again a very plain picture of tohru...sitting against a starry backdrop..
the quote is from when tohru and ritsu are talking..so there is a picture of ritsu in the back..its small but i needed it b.c. without him the quote qould be weird...and thanks to my friend..anim3xfreek for the quote! the picture of tohru is very weird cuz it was hard to extract the picture because of her hair.. I just loved this wall!!! It´s very, very cute!!! Congratulations!!! The poetry in this pic is so beautiful. Awesome wallpaper with a word in it... Thanks for uploading!